80 years ago, the first Nancy Drew book was published. 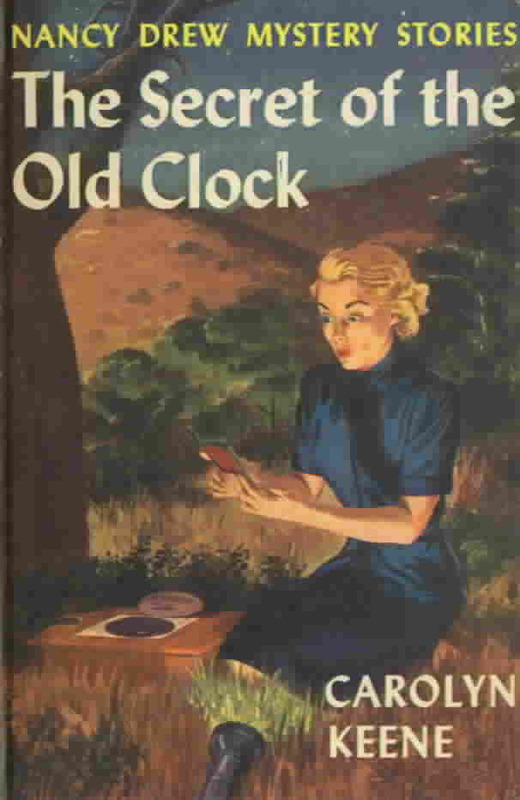 The Secret of the Old Clock introduced readers to a young sleuth by the name of Nancy who was intrepid and curious and regularly got herself embroiled in the most appalling intrigues. It also spawned a series that would stand the test of time, appealing to new generations of readers, female and male alike, who followed Nancy (and George and Bess) wherever her adventures took her. I come from two devoted Nancy Drew readers. Both my mother and my father read her growing up. My dad would bike to the library with his little sister Claudia and they would each check out a stack of five Nancy Drews and five Hardy Boys, read them, exchange, read the second stack, and then return them for more. I never get tired of that story. They both grew up to be such avid readers and I know where it all started. My dad still re-reads them from time to time, when nothing else is grabbing his fancy. 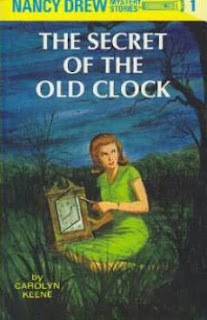 I vividly remember reading my first Nancy Drew. It was actually the second book in the series--The Hidden Staircase --and I was six. It completely freaked me out, gave me nightmares, and I had to put it away and come back later. This still strikes me as funny but I guess I was a fairly sensitive child and it was my first mystery of any sort. I'm just glad it didn't scare me off for good. I returned to the series a couple years later and there was no going back at that point. All my allowance money went to buying new Nancy Drews. When we moved to Sicily I started having a hard time getting my hands on copies. The library had the newer Nancy Drew Casefiles and I was burning through those, but I was also intent on completing my collection of all 56 of the original stories. I remember marching into the tiny base bookstore and negotiating with the manager. If he'd order in the books, I promised to buy them and send my friends in as well. He was skeptical. But I was determined. And I won him over in the end. I've read them all several times each. I think my favorite is still The Clue of the Whistling Bagpipes . I loved the whole Nancy goes to Scotland episode and the eerie, wonderful highland vibe involved. Even an ocean away, he knows me well . Thanks, Dad. I love you, too. I remember reading the Nancy Drew series in middle school--it was instrumental in me learning English, actually! The special edition looks so amazing! What a lovely Dad you have! I was a huge Nancy Drew fan too and I'm drooling over that special edition too, thanks for blogging about it. 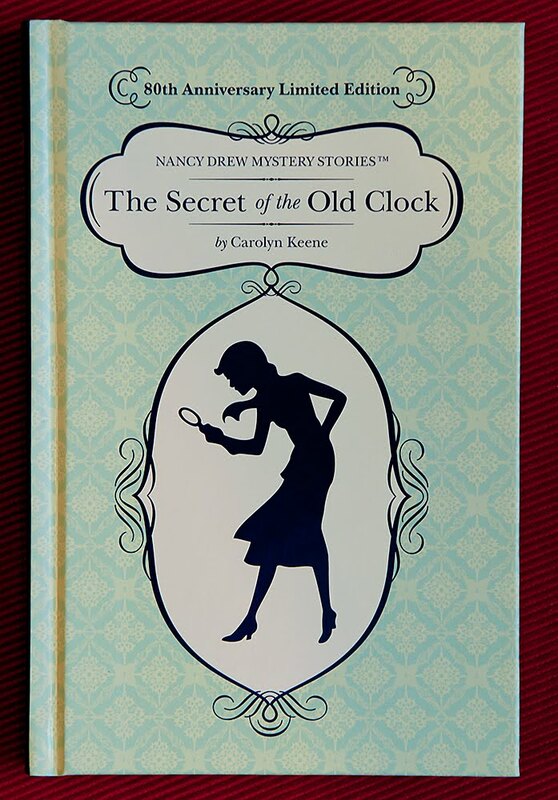 The Nancy Drew covers made me smile as soon as I saw them! Lovely post and what a wonderful dad. PS I may have to admit to loving the Hardy Boys ever so slightly more. Did you read the crossover books, where Nancy and the boys met up? Sandy, how wonderful! I bet they would be good for learning your way around English. Alexa, he's pretty great. It's fun to share things like this with him. Li, I did! I have probably 10 of the Nancy Drew/Hardy Boys SuperMysteries on my shelf. Absolutely LOVED them. All that angst with Nancy and Frank... Good times. I like the new Nancy cover! And I really like thinking back on my Nancy Drew reading days. Going to the library and perusing those mustard yellow spines, hoping I hadn't read them all yet. I better go pick up one now. I actually collect older editions of both the Nancy Drew and Hardy Boys. A favorite, though, was actually the one about Nancy's friends, the Dana Girls Mysteries. I really enjoyed those, but they're super hard to find. And I totally love dads...mine has got me all sorts of great books that are wonderful! I can't believe they started 80 years ago!! And your dad sending you the book? That is the nicest story I have heard all week!! I feel like I've been hearing a lot about Nancy Drew lately, and I'm wondering why I've never read a single book. I guess I've got to remedy that and soon! Deidre Flint (a little known folk singer) has a great song called Nancy Drew which is basically a love letter to Nancy Drew. I hate folk songs, but I love it anyway because it captures how I felt when I used to read Nancy Drew and the crazy things about the series. I also am a huge fan of Nancy Drew, love the new edition. That was so cute of your dad to send you one. I dearly love Nancy Drew. I actually didn't actually read the Nancy Drew mysteries until I was in 8th grade. There are still several which I haven't read because they weren't available in my library. However, I was a huge fan of the Nancy Drew/Hard Boys crossover novels and actually read most of those before ever reading a single Nancy Drew mystery. I secretly wanted Nancy to be with Frank. That 80th anniversary cover is beautiful. Nancy Drew holds a special place in my heart. Do you remember the awesome books where they had two different endings and you got to choose which one to read? Love it! I can certainly prove that Nancy Drew is global! I can't even remember the first time I read Nancy Drew books. I think my cousins from the States sent over some of their old books (Sweet Valley High, Babysitters Club and Nancy Drew) and that's when I started reading them. Your dad is very cool and that's a lovely special edition. Melissa, mustard yellow! haha. So true. Raspberry, that is so awesome. I have this set of probably 10 or so dustjacketed Nancy Drews with the most wonderful illustrations. I wish I could find more of those editions. They're marvelous. And I read a few Dana Girls mysteries back in the day as well. Brizmus, must be the anniversary stuff floating around the blogosphere. And I do (naturally) recommend picking one up. They have a definite charm. Kitten, no way! Thank you for that tip. I'm gonna go find the song now! Kath, I knew you were a fan as well. It really is such a cute edition. Lan, sister! I loved the SuperMysteries as well. Man, I waited with so much excitement for each new one to come out. I can remember walking into the bookstore and seeing the new crossover on the shelf and my stomach just leaping with joy. lol. Nancy and Frank together=awesome. Tiah, there were choose your own adventure Nancy Drews? How did I miss those? Awww, your dad is awesome! My boyfriend is actually currently re-reading through his Hardy Boys collection. 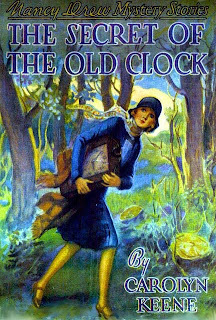 Personally, I love Nancy Drew and her fierce style which is totally a testament to her ability to transcend time. April, I have to agree. That is awesome that your boy's re-reading the Hardy Boys. I love how both they and Nancy just never grow old.